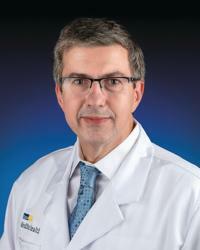 Gabriel Soudry, MD, is a Nuclear Medicine physician serving the Baltimore, Maryland community and is a member of MMGR (Medstar Medical Group Radiology. He received his medical degree from University of the Mediterranean Faculty of Medicine and has been in practice for 23 years. Dr. Soudry speaks multiple languages, including French. In his free time, Dr. Soudry enjoys spending time with his family, visiting friends, cooking fusion food, studying comparative religion and riding his motorcycle. Gabriel Soudry, MD, was named a "Top Doc" by Baltimore Magazine for 2010-2018 for nuclear medicine. What convinced you to pursue a career in medicine? I had a very caring, personable, charismatic family physician as a child. I wanted to become just like him. What's the most satisfying aspect of being a doctor? The challenge of earning the trust of my patients and referring physicians every single day.